Just Genesis : Why Does Genesis Speak of Gods? Why Does Genesis Speak of Gods? The plural form for God in Arabic and Hausa is Allohi, the equivalent of the Hebrew Elohiym. El and Al are very ancient names for God. The plural form appears in Genesis 1: In the beginning eloh-iym (the gods) created the heavens and the earth. It also appears in Genesis 6:2, which speaks of the "sons of the eloh-iym" who took wives from the daughters of men. The plural form reflects a mythical view of the world and relates to the ancient Horites from whom we receive this material. They are the origin of Israel's priesthood and why Jews call their ancestors "horim." The Horite ruler-priests were regarded as deified "sons" of God. They are often called "gods" (elohiym) as in Exodus 22:28: "Thou shalt not revile the gods (elohiym), nor curse the ruler of thy people." Rulers are appointed by God's authority to restrain evil, to establish justice and to reward those who do what is good. They act not only on God's behalf; they act as “gods” on earth. Horite rulers were to be pure and to embody the qualities of righteousness, mercy, goodness, justice, etc. Some were good rulers who tried to live as God desired. These are remembered in the Bible. Job, Abraham, Moses and Joseph are examples. All were Horite rulers. Joseph married Asenath, the chaste daughter of a priest of Heliopolis, a shrine city of Horus and his father Ra. The Heliopolitan cosmogony can be investigated by study of the Pyramid and Coffin Texts. From these texts, it is apparent that Heliopolis was both the city of the Sun and the sacred center of the primeval ocean, Nun. The many pillars that comprised the temple complex symbolized the connection between the waters below and the waters above (Gen. 1:7). Joshua, son (bin) of Nun, likely was of a ruler-priest family associated with this prestigious complex. This is supported by the fact that Joshua (Yeshua) is the only spy in Numbers 14:4-16 for whom the Arabic bin is used for son, instead of the Hebrew ben. Horite priests served in the temple on a rotating schedule. It is from the Horite priesthood that the priesthood of Israel developed. Moses' brothers Korah and Aaron were Horite priests before the nation of Israel existed. The Horites worshiped the Creator who emblem was the Sun when other peoples were worshiping idols of false gods. They anticipated the coming of the Seed of God (Gen. 3:15) and believed that He would be born of their royal-priest bloodlines. That is why the lines of priests intermarrried exclusively and why unchaste daughters of priests were burned alive (Lev. 21:9). Sexual impurity was not tolerated. The Horite priest was purified before entering the temple. His purification involved fasting, abstinence from sexual relations and alcohol, ritual bathing, and an intense period of prayer. Korah, Moses' half-brother, was a priest according to Numbers 16:17,18. His name means "shaved one." Horite priests shaved their heads and bodies as part of the purification ritual. The ruler-priest's reward for righteousness was life after death. This is why great pains were taken in their burial. In pre-dynastic times and in the earliest dynasties the people were believed to follow their deified ruler from this world to the next. Their immortality depended on that of their ruler. This is why the ruler was to be righteous and undefiled by contact with blood or corpses. The procession to the ruler's tomb was the earthly journey that would be continued beyond the grave at the deified ruler's resurrection. 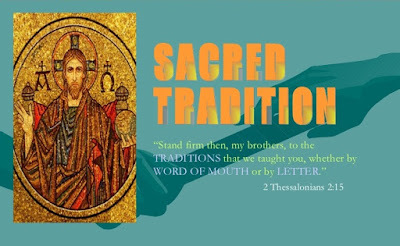 This stands behind Paul’s description of Jesus Christ leading captives from the grave to the throne of heaven in Ephesians 4:8: "When he ascended on high, he led captives in his train and gave gifts to men." The same idea is reflected in Psalm 68:18: "When you ascended on high, you led captives in your train; you received gifts from men, even from the rebellious--that you, O Lord God, might dwell there." As far as we know, none of the ruler-priests rose from the grave to ascend on high, except Jesus Christ. This was the ultimate test of authenticity. The Horites called Hor (Greek Horus) the "son of God" as he was conceived of a virgin queen who was overshadowed by the Sun, the emblem of the Creator Re. Hor's mother was called Hathor-Meri (later Isis) and her animal totem was a cow. She is shown at the Dendura Temple holding her newborn son in a manger or stable. The stable was constructed by the Horite priest Har-si-Atef. Atef was the crown worn by deified rulers. The Arabic word atef or atif means "kind." The ruler who wore the atef crown was to embody kindness and he was to unite the peoples. Horite belief in a deified son who would embody kindness and unite the peoples found fulfillment in Jesus Christ, a descendant of the Horite ruler-priests, the divine son of the Virgin Mary, daughter of the priest Joachim of the line of Nathan. Jesus Christ is the fulfillment of the promise made to Abraham's Horite ancestors in Eden (Gen. 3:15). This is why Frank Moore Cross cannot avoid the conclusion that the God of Israel is the God of the Horites. Here we find the words of Psalm 110:1, a messianic reference: The Lord says to my Lord: "Sit at My right hand until I make Your enemies a footstool for Your feet." Likewise, Psalm 2:7,8 declares: "I will surely tell of the decree of the Lord: He said to Me, ‘Thou art My Son, today I have begotten Thee. Ask of Me, and I will surely give the nations as Thine inheritance, and the very ends of the earth as Thy possession." The thrust of the message is clear: One lives who is far greater than the other gods, be they mythical or deified rulers on earth. He is the unique Son of the Father and all things will be made subject to him. The language is ancient, as is the conception, but clearly the Christian understanding of Jesus Christ is found here in kernel form. The correspondence between the Horus Myth and the story of Jesus can be explained in two ways. Either Christians borrowed the Horus myth or Christianity emerges in an organic way from the belief system of Abraham and his Horite people. If we decide that Christians borrowed the Horus myth, we must explain why they should have selected this particular myth. In reality, no other religions prefigure Jesus Christ, the Son of God, other than the faith of Israel as it emerges out of the faith of Abraham's Horite ancestors. The book of Exodus provides further evidence that the term elohyim relates to Horite belief. Moses and his family were Horites as is evidenced by the unique Horite marriage and ascendancy pattern of Moses' family. 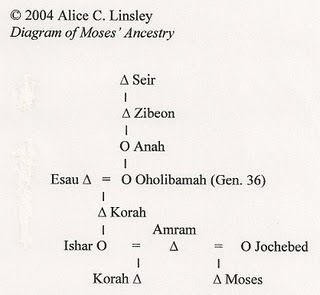 The diagram shows that Moses' father Amram married a descendant of Seir the Horite (Gen. 36). She was his cousin or niece bride and Jochebed was Amram's half-sister wife. Here God judges the rulers in the midst of the rulers, the elohyim/gods who comprise the divine council. Verse 2 identifies the rulers as those to be judged. In Psalm 72 they are called shaphat, a name associated with the Horites in Numbers 14:5. One of the spies sent into Canaan was Shaphat ben Hori. Note also that the New American Standard Bible renders elohiym here as rulers. Psalm 58:1,2 - "Do you indeed speak righteousness, O gods? Do you judge uprightly, O sons of men? No, in heart you work unrighteousness; on earth you weigh out the violence of your hands." A similar condemnation is found in II Chronicles 19:6,7: "And he said to the judges, “Consider what you are doing, for you do not judge for man but for the Lord who is with you when you render judgment. Now then let the fear of the Lord be upon you; be very careful what you do, for the Lord our God will have no part in unrighteousness, or partiality, or the taking of a bribe." This condemnation is directed against the elders and rulers of the people. Consider this from Isaiah 3:13-15: "The Lord arises to contend, and stands to judge the people. The Lord enters into judgment with the elders and princes of His people, “It is you who have devoured the vineyard; the plunder of the poor is in your houses. What do you mean by crushing My people, and grinding the face of the poor?” (cf. Ezek. 34:1-6). Among the Horites there was a hierarchy of ruler-priests. The king was the Creator's representative on earth and the ruler-priests were his lesser assisting authorities. Together these comprised the earthly council, a reflection of the henotheistic heavenly council. The archaic principle "as in heaven so on earth" is clear in the pattern. The King as the highest power was expected to be the most pure. That is why his person could not be touched by ordinary citizens. Under the king were his counselors who spent much of their time at court in the king's presence. Under the royal counselors were those who served in the temples or shrines as assistants to the higher ranks of priests. A similar order existed among the priests in Jerusalem. Hierarchy is not a popular word in our time, but it is a characteristic of the ancient world and of the Biblical worldview. The king-subject hierarchy, the master-slave hierarchy, the father-son hierarchy and the husband-wife hierarchy are ideally expressed in love and mutual devotion. So wives are to submit to their husbands as “to the Lord” (Ephesians 5:22), and slaves are to submit to their masters as “to Christ” (Ephesians 6:5). Very informative as usual Alice! But I was wondering about the reference to Genesis 1 - gods (Elohim). How does one explain these gods saying, "Let us make man in our image?" Genesis 1 could be talking about temple design - modeling Heliopolis. But how does making man in their image fit into this? Or is 'Elohim' of Genesis 1 the traditional view of God himself? Even so, why would he say "us"? Let us make..." would be God speaking in the divine council. Compare to I Kings 22:19, Isaiah chapter 6, and Job chapters 1-2. Making Man in the divine image is necessary if Man is to image the divine. This was the Creator's intention from the beginning. The idea is extended to dominion. As God has dominion over all things, Man has dominion over the earth. Thanks for linking this in your email message. Very nicely put together. I do still have some questions though. I like the idea of "benea ha 'elohiym" being the sons of deified rulers. That explanation makes sense to me. The problem is that I'm not sure what to do with the "daughters of men" terminology. Genesis 6:1 says, "And it came to pass when men (adam) began to multiply on the face of the earth, and daughters were born unto them." This is referring to humanity in a general sense, and the daughters being born in a normal sense. Then the text continues, "That the sons of God saw the daughters of men (adam), that they were fair, and they took them wives all of which they chose." I'm not sure why the text is contrasting "sons" with "daughters" as well as "gods" with "men". Why not just say, "The sons of God, took wives"...? The Book of Enoch (while a controversial book) makes it pretty clear that these "sons of God" (in this passage) are some form of angelic beings that left their heavenly habitation, and took human wives. The "sons of God" terminology also pops up in the Book of Job, with the other-worldly meeting of Satan, God and the Sons of God. Whatever is going on in this passage, the Bible further seems to imply that this "co-habitation" is not something that is pleasing to God, for it's mentioned right before God's regret of making humans in the first place, that dwindled into violence. There's also 2nd Peter 2:4,5 and Jude 6,7 to consider. In these passages it talks about angels leaving their normal place of habitation, and being reserved to everlasting chains of darkness for their wicked deeds. And it's mentioned right before the Flood of Noah. The only place in Genesis where these passages would apply would be the sons of God/Daughters narrative. To be honest I'd rather go with "sons of deified rulers", but then I'm stuck with other places in the New Testament that I struggle to understand. The passage in question relates to other titles given to the early rulers: "the mighty men of old," described as heroes and men of renown. They were the first city builders. They built temples and shrines, pyramids, palaces, and royal treasuries. They are called Nephilim - great ones, drawing on the Arabic nfl, meaning great. They also are called gibboriym, the mighty ones. These were rulers who established themselves over territories from Africa to Anatolia and from Arabia to Southern China. Among them were the Habiru (Hebrew) ruler-priests, an ancient caste that served at the royal temples and shrines.